Coles announces new custom-designed frames to make it easier for customers and staff at checkout. 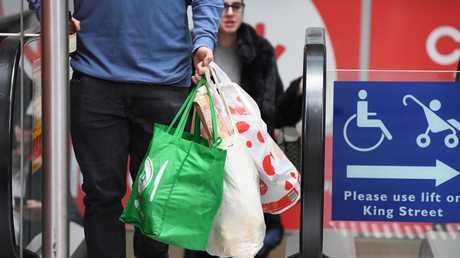 WHILE Aussies are adjusting to life without plastic bags, a big problem remains: checkout bagging areas fail to accommodate the new reusable bags. 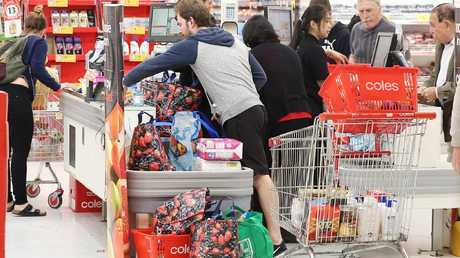 Coles and Woolworths customers have complained that the new, thicker plastic bags don't fit on the self-serve check-outs. At the same time, shoppers have noted that staff are much slower when handling and packing the new bags at regular check-outs. However, one major supermarket has made a simple adjustment that could ease customers' shopping woes, creating fewer delays and less frustration. Coles has revealed to news.com.au that it has redesigned the frames bags hook onto. "We are currently putting in custom-designed frames that are easier for customers and our team," a spokesperson said. He said the new design was being fitted in stores across the country and was expected to be completed in the coming weeks. The spokesperson is yet to confirm whether the entire bagging area is also part of the redesign. 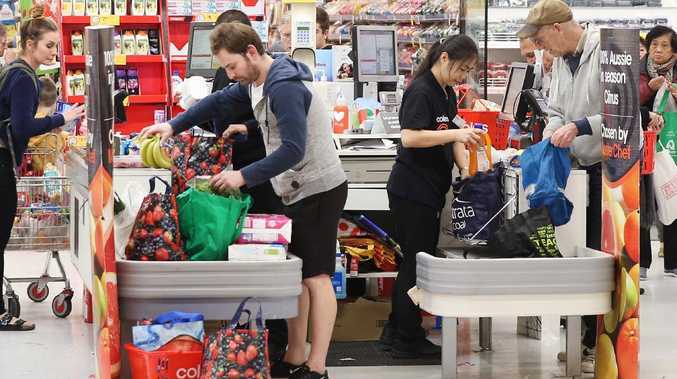 Coles also recently announced it would continue to offer its 15c reusable plastic bags for free to help customers make the switch after the July 1 ban on single-use bags sparked a deluge of complaints. Now, all eyes are on Woolworths with its customers saying it too needs to make a change. Woolworths said there were no plans to make any adjustments to its bagging areas, but it left the door open to changes in the future. "While we've found the existing carousels have​ continued to​ work well for customers in states and territories which have been single-use plastic bag free for some time​, we're always looking at new ways to improve the service flow in our stores," a Woolworths spokeswoman told news.com.au. "We thank customers for their patience and understanding as we work with them to remove 3.2 billion single-use plastic bags from circulation each year for the benefit of our oceans and marine life." The spokeswoman said the supermarket had the same carousel layout at the checkout in all its stores nationally, including in South Australia, the ACT, the Northern Territory and Tasmania where single use plastic bag bans have been in place for a while. "New reusable bags also have small holes at each end to fit onto the carousels and make packing more efficient," she said. "Our teams are working hard to serve our customers quickly and effectively as we transition away from single-use plastic bags." Woolworths hasn’t announced changes to its carousel but says ‘we’re always looking at new ways to improve the service flow in our stores’. Winona Tuala, who regularly shops at Woolworths Central (Metro) in Surry Hills, said the bag stands at self-service check-outs didn't accommodate her reusable bag. "There is not enough space; there needs to be more room," she told news.com.au. Another customer, Marlon Aronowitz, said change was needed "absolutely". "They need to make it house the different reusable bags. It doesn't have to necessarily be a big space, but the current design has bags falling over; it's not fit for different bags," he said. While each major retailer handled its campaign differently, they both shared one thing in common, an outpouring of "plastic bag rage". One Coles customer recently took to social media to express her anger over claims its staff needed "retraining" in packing reusable bags. The Queensland woman, Hope Amy Leah Wood, complained to Coles in a Facebook post asking: "Can you please do Australia a favour and teach the staff to pack the bags properly?" 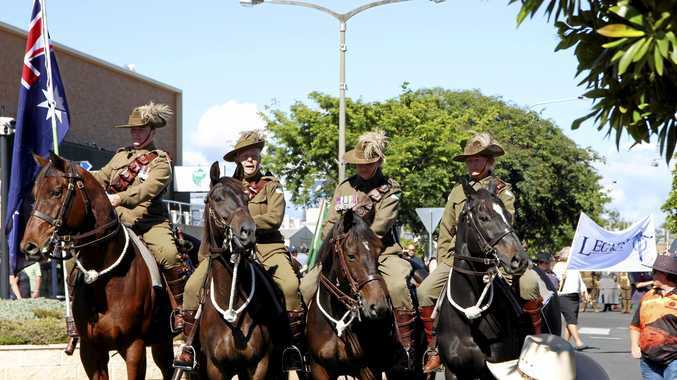 While both retailers copped plenty of flak over the way they handled the ban, advertising experts have said when it comes to the battle of the supermarkets' advertising campaigns, Coles could claim victory over Woolworths. But again, the bad news for both is that overall shoppers could be spending less thanks to the awkward handling of the implementation of the ban. Despite the endless drama, the plastic bag ban has won strong support from shoppers, with just one-fifth saying they disagreed with the move. It is clear the ban is here to stay with both supermarket giants uniting in their approach towards an environmentally friendly Australia.